After having carefully reviewed the market for a monopod to carry my Canon 40d with a Sigma 150-500, I finally decided for the Feisol CM-1471. I do not regret my decision, and I bet I never will. I was very reluctant to shell out a large amount of money for a Gitzo - one of the most popular manufacturers. Also, I had decided to go for carbon fibre. After having read great Feisol reviews I bought myself the CM-1471- The whole ordering process was hassle free, and customer support is great. The monopod comes with a simple bag, and a handy tool to chande the main thread. The monopod is very light weight, and the build quality is superior. I simply cant give it enough praise. The locks are easy to work and lock instantly. The fitting of the separate parts are impressively tight. This is simply an outstanding product offered at a _very_ competetive price! The Larger monopod feisol offers. $100 basically. To get something similar from anyone else I would have had to pay considerably more. When I was at the store trying some various ones out, I noticed the Feisols smallest leg was as wide as mosts main leg!!! At almost 1.5", the main leg is HUGE. I am quite impressed by their quality for the price you pay. Im always a bit hesitant with price outliers in the the competition, but Feisol is definitely there! Solid! Their website says 66 inches long...im measuring 67.5. With an RRS panning clamp and a 5DmkII and L clamp, the eye piece is at 72 inches. I can fully extend the monopod and hold it out from the second and third leg to get my camera into higher vantage pointers and it barely stresses or bends. Very impresses considering how most tripods that were $200+ had spindly little legs at the bottom that I thought would snap just under my own weight leaning on them. The feisol has a very solid plate. There is a wrist strap...but I might swap it out for a longer and sturdier strap. The hand grip is thick and well padded. The carrying case it came with is actually well padded too! This is NOT a dinky little "attach to your shoulder bag monopod for hiking" that can really only hold your point and shoot but is claimed to hold a lot more. The 1471 is HUGE. I needed this for vantage point extensions with my fisheye, as well as something to support the 300 and 400 superteles. It does so easily and can take even more. Insanely solid. For under $100, it quite possibly is the single best deal out there! I was originally looking towards some of the large Gitzos to replace my tripod as well....but I think now i will definitely be going with the Feisol CT-3472. It looks like its basically three of these monopods with a solid base! Awesome. 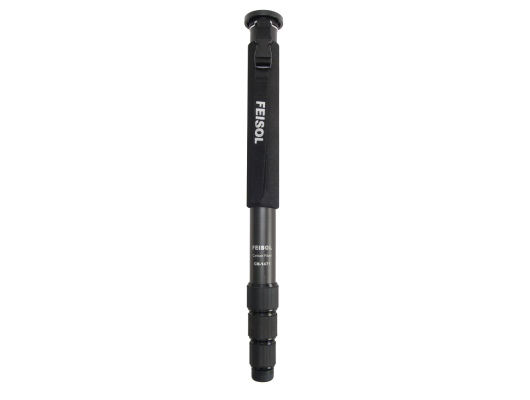 Quick Add: One big difference between the Gitzo carbon and feisol... The Feisol feels SOOO MUCH better in touch. The carbon has a smoother surface, not by much...but enough to make a difference. The Gitzos always drove me crazy because it felt like a nail across a chalkboard if my nails were to run across it! Very annoying. Feisol has a much nicer surface texture! Just so you know how much I love my CM-1471, and maybe I've just had really bad luck with previous monopods, but when it arrived last year from Adorama and I pulled it out of the box, I think I sat there holding it for 20 minutes. The feel of it; the sound of it; one can only appreciate in person. If my wife would have allowed it, it would have spent the first night in bed with me. Almost a year later, I still feel a little thrill when I grab it to head out the door to an event. I enjoy it that much. More than any other piece of photo equipment I own. My Nikon D3s maybe came close, and the D4s might take the top spot when I make the leap, but for now it's my simple, little FEISOL CM-1471 Monopod.